← Where is the high probability? How can a hurricane near the USA affect the weather in Europe? It may seem bizarre that processes occurring within clouds near the USA, involving tiny ice crystals and water droplets, can have an influence on high-impact weather events thousands of kilometres away in Europe, and our ability to predict them days in advance. However, this is the fundamental nature of the atmosphere as a chaotic dynamical system. Information is transferred from one region to another in the atmosphere through wave propagation and transport of properties within the air, such as water vapour. Weather systems developing over the North Atlantic and hitting Europe are intimately related to large-amplitude meanders of the jet stream, known as Rossby waves. Characteristic weather patterns grow in concert with the waves, and the jet stream acts as a wave guide, determining the focus of the wave activity at tropopause-level (about 10 km altitude). Rossby wave energy transfers downstream rapidly, amplifying the meanders and the weather events associated with them. Perhaps even an even greater stretch for the imagination is the idea that you could direct research aircraft and weather balloons into the jet stream across the Atlantic to understand how a tropical cyclone near the USA can influence a wind storm in Scotland and then flooding in Norway. Nevertheless, this is what was attempted last month in the North Atlantic Waveguide and Downstream Impacts Experiment (NAWDEX). The experiment involved five research aircraft equipped with lidar, radar and dropsondes (measurement devices that fall on small parachutes from the aircraft) for measuring high resolution cross-sections of winds, temperature and humidity. The aircraft furthest upstream was the NASA Global Hawk UAV (flying from the USA as part of the NOAA SHOUT programme). The German HALO (cloud radar, water vapour lidar and dropsondes) and DLR Falcon aircraft (two wind lidars) were based from Iceland for the whole campaign month (16 September to 16 October this year), as was the French SAFIRE Falcon (cloud radar and lidar). The UK FAAM BAe 146 aircraft (cloud microphysics and dropsondes) joined from East Midlands airport. In addition, more than 300 weather balloons were launched from ground sites spanning from Canada in the west to Norway and Italy in the east, Svalbard in the north and the Azores in the south. Even commercial ships crossing the mid-Atlantic launched balloons for NAWDEX. A scientific experiment on this scale cannot be conducted by one nation. Contributing countries included Germany, France, UK, Switzerland, USA, Canada, Iceland and Norway as well as the met services from countries who launched weather balloons as part of the EU-funded mechanism EUMETNET (UK, Denmark, Norway, France, Portugal and Italy). International cooperation is achieved through a common purpose and determination and also with coordination through a working group of the WMO World Weather Research Programme. A golden opportunity emerged during the second week of the NAWDEX campaign, as tropical storm Karl moved northwards from the Bahamas and was forecast to interact with the jet stream with highly uncertain outcomes in terms of high impact weather for Europe 5-6 days later. The Global Hawk was first to the scene with a comprehensive coverage of dropsondes on the night of 22/23 September. Tropical storms move slowly and Karl was sampled again off the east coast of the USA on 24/25 September. Then there was a dramatic change as Karl interacted with the jet stream on the 26th undergoing a process called “extratropical transition” when the cyclone also intensified. The German HALO aircraft was able to reach the centre of the storm during this critical stage from its base in Iceland. Following transition, the jet stream on the southern flank of cyclone Karl became much stronger and the whole system was stretched out and advanced very rapidly towards the north of Scotland where it was intercepted by both the UK FAAM aircraft and German DLR Falcon aircraft coming together above Torshavn (Faroe Islands) from their bases in East Midlands and Iceland. Above the Scottish north coast the jet maximum was observed to be 89 m/s (200 mph) which is unusually strong for the time of year and was associated with severe winds at the surface across northern Scotland. I was lucky enough to be on the flight. So was BBC science correspondent, David Shukman, who reported on his experience on BBC TV and website. The jet streak (a locally intense section of the jet stream) moved into Norway and was followed by two days of persistent heavy rainfall and flooding as a moist air stream from the mid-Atlantic was drawn northwards to meet the jet stream on the Norwegian coast. What do we hope to learn from the sequence of research flights? We will focus on detailed measurements of cloud physical properties and their relation to the structure of the winds and temperature in the vicinity of the jet stream and its evolution over days to weeks. Recent research has shown that forecast ‘busts’ (where skill is much lower than usual) for Europe share a common precursor 5-6 days beforehand; there is a distinct Rossby wave pattern with a more prominent ridge (northwards displacement of the jet stream) across the eastern USA. The reasons for these forecast busts are not known, but it is hypothesised that the representation of diabatic (cloud and radiative heating) processes, over the USA and Atlantic, lowers the predictability in this situation. Diabatic processes create shallow temperature structures either side of the tropopause, tending to enhance tropopause sharpness and the jet stream wind maximum. Recent theory indicates that tropopause sharpness can have a far-reaching influence on Rossby wave propagation and thereby downstream forecast error. However, the sharpness is not well represented in both models and satellite data due to poor vertical resolution in the tropopause region. We already know from a first look at the flight data that the tropopause was observed to be sharper than represented in forecasts, but much more scientific investigation is needed to understand why. The same physical processes that are poorly represented in weather forecast models also constitute a major source of uncertainty in climate model projections and make the prediction of changes in regional precipitation and wind patterns in response to global warming very uncertain. Among them are cloud microphysics, cloud radiative feedbacks, and turbulent boundary layer dynamics, which are parameterized in both weather and climate models. NAWDEX will help us to improve our representation of these processes by furthering our understanding of how the physical processes influence synoptic-scale dynamics, thereby affecting not only mesoscale sensible weather but also large-scale weather regimes. Only once the physical processes are represented well in models, can the excitation and maintenance of large-scale patterns on seasonal timescales by global teleconnections, or downscaling of climate information for the Atlantic/European sector, be tackled with confidence through numerical simulation. 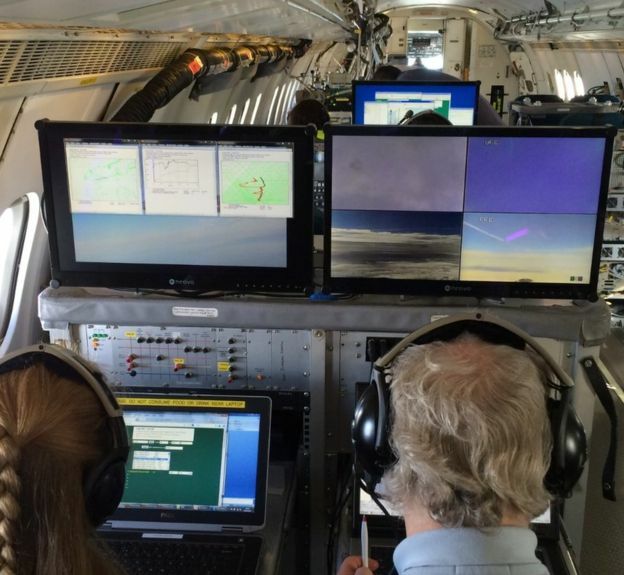 If the idea of taking a research aircraft into the jet stream to discover more about the atmosphere excites you, then you should consider a career in atmospheric physics. There are an ever expanding range of employment opportunities with specific environmental physics skills, as well as more general openings for graduates with the problem solving and analytical capability that training in physics and mathematics brings. Our Department offers undergraduate degrees in Environmental Physics and Meteorology. If you have already done a first degree (perhaps in Physics, Mathematics or other physical science) you could consider the MSc in Atmosphere, Oceans and Climate, or entering directly onto the PhD programme. This entry was posted in Environmental physics, Measurements and instrumentation, Numerical modelling, University of Reading, Weather forecasting. Bookmark the permalink.